Grab your bags, open the Uber app, choose a ride option and tap 'request'. 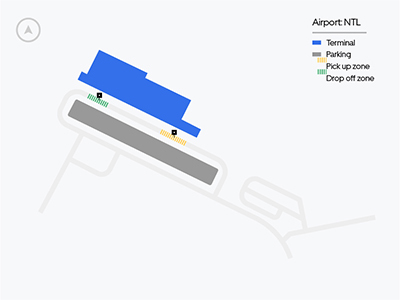 Newcastle Airport charges a pickup fee, which is automatically included in your fare. Head outside to the pickup area. Exit the terminal and meet your driver at the public pick-up zone. Your app will show you where to go once you’ve confirmed your request. At the arrivals end of the domestic and international terminal, simply head outside to meet your driver at the public pick-up zone. Getting an Uber ride to Newcastle Airport is as easy as requesting a ride and setting your destination to NTL Airport.